About six years ago, I revamped the process we use to do calendar planning for my ministry. Planning the calendar is something I look forward to because it’s time with my team to dream and explore what the coming year is going to look like. I also feel really uncomfortable when I don’t know what we’re doing six months out – so having 12-18 months worked out brings peace to my life. Every Fall (usually), I take my team offsite and we hammer out the next 18 months of ministry planning. This allows us to know what we’re going to accomplish this year. We realize that once we get past 12 months, things get fuzzy. School schedules aren’t usually published, so we put stuff on the calendar, but review those “far out dates” again in January so we can solidify our plans. How do we practically plan out and schedule our ministry year? More on that tomorrow. First, these three things need to be decided before you put a single event on the calendar. Why does your ministry exist? What are you really trying to do? Try to look at your ministry with a clean slate, ignoring the things you do like summer programs, mission trips and camps. Those are just tools and means to the end. What is your end? What’s important to you? What do you value most? What are your non-negotiables? What battles are you willing to fight? If not, you’ve got a calendar problem. How did that get on the calendar? Who put it there? What’s the quickest way to make sure it doesn’t happen again. It might be that you’ve got some good stuff on your calendar, but is it keeping you from doing the best stuff you don’t have time for? Don’t have a vision for your ministry? What’s our mission? What values? If you haven’t clarified these things, you’re just going to do random stuff. Take some time away and get clarity on these things first – then you can be strategic about what goes on the calendar. So, what do you want to do this year? What does your pastor want you to do this year? Have you written up any goals for the year? How many kids do you want in Small Groups? How many kids would you like to see baptized? How many kids do you want to take to camp? How many volunteers do you want to have this time next year? There’s a very interesting link between the calendar and our goals. Most people don’t understand this. If I want to see 100 kids baptized this year, I know that this means I need to schedule 4-6 baptisms this year. I need to schedule a strategic baptism class immediately following camp and the parent gathering where I’ll cast vision for next steps for kids. If I have specific attendance goals, I may need to schedule some “high-attendance” experiences in a season when attendance usually begins to decline. There’s two ways at looking at this. I’ll start with the way the world “should” be. You should plan your calendar, being as strategic as you can – aligning events and programs with your values as well as aiming at your annual goals. 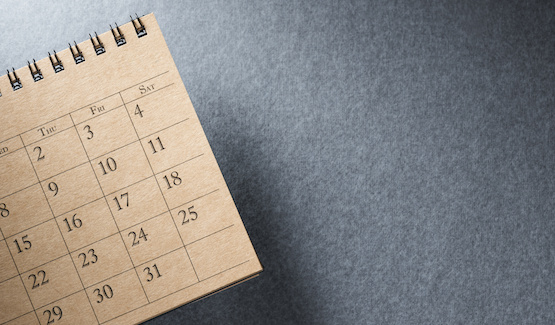 Once your calendar reflects this, determine what it’s going to cost to pull off these events and plan your budget accordingly. This might mean requesting additional funds in order to pull off the year you’ve scheduled. Again, this is the way it “should” be. Now let’s look at how it is. You know how much money your ministry area has been given. It’s the same you had last year and the year before that. Unfortunately, someone else determined how much your ministry needs and now it’s your job to stretch every dollar. Sound familiar. This means that as you plan your calendar, assess the resources you have to ensure you can do everything you need to accomplish your goals as best as you can. This means taking an honest look at what you have and saying no to some things you’ve been doing for years. What programs/events would flourish if you properly funded them. What have you been doing that really doesn’t push your organization forward? Bottom line. It’s time to stop just putting stuff on the calendar. Its time to stop doing the things we’ve done every year simply because we’ve been doing them every year. It’s time to get serious with your time. Now, have the best year your ministry has ever seen! Your welcome. Glad you find this helpful! Very helpful as I’m sitting down with my different teams to think through the upcoming year. Thank you!